Q. Congratulations on your victory. How are you feeling? A. I'm happy that I won for the second time, and I will keep trying to win for the third, fourth and even eighth time. Q. You kept your promise you made on media day that you would win 4:1. A. I played comfortably. I was able to keep my own pace. Q. What was the purpose of the nexus ceremony in the second set? A. I wanted to intimidate the opponent and follow up from the zealot dance in the first set. Q. With the victory today, you are now the number one in the prize ranking as well. How much more money do you want? A. I'm setting my goal to 300,000,000 Won. If I participate in other tournaments like TSL, I should be able to surpass this goal easily. Q. Did you expect ST_July's drop in the third set? A. I didn't expect it at all. I was expecting him to come from the front, and I was very shocked to see him drop at my main. Q. What did you think after losing the third set? A. I thought 'I just took a punch'. I was already preparing for the dark templar build in the next set, so it didn't bother me that much. Q. You didn't do a lot of damage with the dark templars in the fourth set. A. I thought it was alright since I kept all of them alive and even killed a queen. The build was to lead the game to my flow. I even ordered my practice partners to start with making spore crawlers during my practice games. Q. How are you going to spend the prize money? A. I'm going to save up and buy a house. I bought my mom a new car with last tournament's prize. Q. Are you planning on going on a diet? A. Since being a progamer is very stressful, I relieve that stress by eating. I'm still exercising a lot, so I think I will lose some weight in the near future. Q. You didn't use any colossi today. A. I was confident in my gateway unit control. I didn't purposely neglect them, but I just played according to every situation. ST_July didn't force me to make collosi, so I played based on gateway compositions. Q. With the second title, you have become the best. Who do you think can catch up to your career? A. I don't think anyone can catch up to me. I don't know about second places, but I will always keep winning. As per each race, I think MarineKingPrime and IMMvp are the 2 best terrans, but IMMvp was knocked down to Code A recently, so it narrowed down to just MarineKingPrime. I think IMNesTea, ST_July and oGsZenio are the best zergs, and SlayerS_Alicia and sanZenith are the best protosses. I'm also expecting a lot from other oGs protosses. Q. What are your goals in the World Championship and GSTL? A. I want to win in GSTL and that's pretty obvious. However, I want to put winning aside for now and work well with my teammates first. For the World Championship, Korea will be battling against other foreigners, and I don't think I even need to play, so I'm not putting too much focus in that. Q. Are you planning ahead for the group selection for next season? Q. What nickname do you like the best? A. I like 'Protoss President'. I heard that foreigners call me 'boss'. I want to be called "Protoss Bonjwa' in the future. A. oGs is now sponsored by ESH. I want to thank the related personnels. 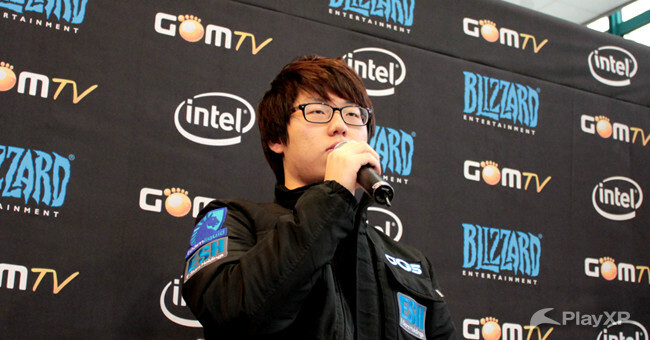 I also want to thank Manager Hwang Kyu-Hoon, Coach oGsTheWind and oGsGon for allowing me to focus on gaming. I will try my best to win in GSTL as well. I also want to thank my mom for always cheering and texting me words of courage. I lol'd at jinro being the only person capable of throwing MC into the air. "I like to tape my thumbs to my hands to see what it would be like to be a dinosaur." lol isnt it kinda rude to ask him if hes planning on going on a diet? Lol on.. calling out his own coach. Haha, wtf is this? I thought Koreans were supposed to be polite. Is MC fat? "Korea will be battling against other foreigners, and I don't think I even need to play, so I'm not putting too much focus in that." Thanks for translating so quicky! Haha oh wow, MC calling out his own coach. What's considered impolite in one culture may not necessarily be the same in another. Not that I know much about SK, just speculating. Anyway awesome interview. MC really is sure of himself. That makes me feel a lot better after reading that thread about SC2 being too volatile, hopefully it's starting to stabilise and we may even soon see the emergence of our first bonjwa. Pffffttt hahaha, MC you are the best. What kind of question... lol. Rude to ask someone as they win. "Hey great job today, you're an amazing progamer. Kinda chubby though, any plans to fix that?" It will happen sadly . Nice interview, a bit rude with that diet question tho. He's not fat come on, it's not like every progamer has to be as skinny as byun,hyperdub or ensnare. Lol, hilarious interview. "Since being a progamer is very stressful, I relieve that stress by eating." Scene is so volatile right now though, might not be possible. I really lol'd at the diet comment. July is much heavier! "So july, you're in the GSL finals. How do you feel?!" LOL "are you going on a diet"
Only one more gsl then he's the first bonjwa.. I can see it.